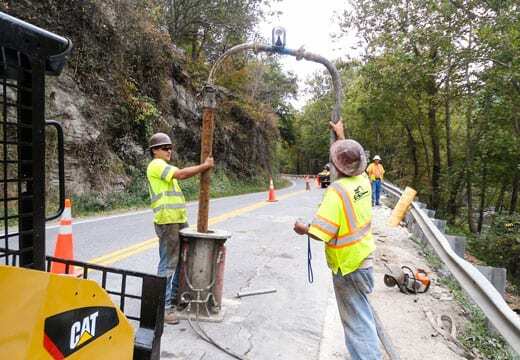 As told by GSI Project Development Engineer: A pipeline contractor dug a trench through the county road, down a steep bank, below a stream, and then up the next mountain to install the pipes. When they went to backfill the pipes in the roadway and embankment, the soil slipped and they couldn’t keep the backfill in place. We got a call to come out and look at the site. We gave them a proposal to build a GCS toe buttress at the stream bed, and then have the pipeline contractor construct a reinforced slope to rebuild the embankment. As the GCS was nearing the top, a WVDOH engineer stopped out to the site. The engineer was asking the pipeline contractor what the plan was, as he had general concern that the road would be repaired back to his satisfaction. As soon as the contractor mentioned GSI was working on the job, the county engineer said ‘OK, as long as GSI is on the job, I’m good here’.